Lately, I’ve been assigning more value to my time. I have big financial goals I want to reach, but I’m a bit tired of sacrificing all of my energy to reach them. As a result, I’ve been looking at different ways to increase income without working more. If you’re an aspiring millionaire, or if you just want to spend more time with the people and activities you love, try using one or any combination of the methods below. These are the most effective ways I’ve found of increasing the money that comes in every month without sacrificing the valuable commodity of time. Investing can be one of the most hands-off ways to watch your money grow. We’ve been regularly contributing to retirement accounts for the first time in a long while. Watching that number grow has been a nice feeling. There are more hands-on ways to invest, too. Investing in real estate can bring in a nice stream of money every month, but you have to either set aside the time and resources to manage the properties or pay someone to do it for you. Investing directly in start-up businesses is another approach, though it can be a bit riskier. Depending on your level of investment, you may also feel more inclined to participate in activities that will aid in the success of the business. This could end up defeating the purpose, costing you more time. If you work a traditional job, ask for a raise. Make sure you can justify why you deserve one. When you go into negotiations, make sure to do just that: negotiate. Another option for those in traditional jobs is to look at making a lateral move. See if someone will pay you more money to do the same job somewhere else. If you really want to stay where you are, the fact that you have another option on the table can give you the leverage you need to get higher compensation at your current place of employment. If you work for yourself, raise your rates. If you don’t value your time at a higher price, no one else is going to, either. The 80/20 rule is a pretty universal rule that says 20% of our work garners 80% of our results. Therefore, you should spend 80% of your time on the 20% of your workload that is bringing you the bulk of your income. By prioritizing your tasks, you can spend more time doing the things that will actually bring you results. Along the same lines, automating aspects of your business can save you a lot of time. The biggest time thief I can think of for those who run their own businesses, especially ones based online, is social media. Dedicate a small portion of your week to automating (most) all of your tweets, pins, and posts so that you don’t have to spend time on it throughout the other six days. Social media has a tendancy pull you down a rabbit hole, so the less time you actually spend on these platforms, the more productive you are likely to be. You should still participate and engage with your audience, but if you don't have to spend time promoting regular content daily, why would you? Looking for higher paying jobs? Want better opportunities? Get out there and network. Networking has been the single best thing I’ve done for my income levels. When people know you, see you around, and hear from you often, you’re more likely to pop into mind when work opportunities arise. The more people you know in your industry, the more likely you are to connect with higher paying clients, which can be used to replace the smaller income streams you are currently spending your time at. 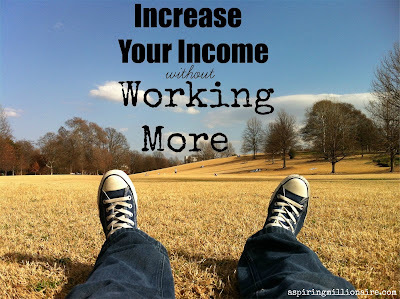 Have you ever increased your income without necessarily working harder?